Today is a great day!! My children are home from their vacation. Some semblance of school will start on Monday. I’m anxious and I don’t know why! A Martha Heart will be launching soon. I’ve already been working on my first post. WooHoo! My time online and around the house will be better prioritized…I hope. I want a laptop. I think. I’m going to start taking my vitamins everyday. I need the benefits as well as the strength. Brian and I will be starting up in business again come September. Something we’ve been a part of for about 15 years. We took a small 2 year break, but we’re ready to jump in and make a difference in other family’s lives and be profitable. The business? Amway. We’re proud to say it! The mentorship that we received is what has helped Brian and I in our marriage and walk with Christ. What we’ve learned is priceless and valuable. The content of this blog is the direct result of that mentorship. That’s enough randomness for now..only because we’re heading out to lunch with the in-laws. 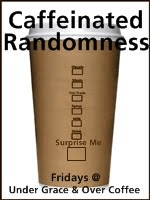 Take a peek at all of the other randomness going on at Under Grace and Over Coffee!